Finally...the long-running Mason Dixon Bubble curtain project is finished. Started this time last year and doggedly picked up at irregular intervals, it's been one of those knitting projects which just runs and runs, never appearing to get any longer until suddenly... it's done! I'll never knit another curtain, that's for sure. The best part of the whole deal was blocking, and watching the crumpled heap miraculously stretch and open up into a curtain-like shape. I soaked the curtain in cold water, then used a million pins to fasten it to a large bit of plywood which I propped outside in the sunshine. It took only a couple of hours to dry and along the way I squirted it with copious amounts of starch for added stability and form. And finally...the grand hanging! Amazingly, it was the right size for the window! (my sizing is a hit and miss affair...) The starch helps it hang without sagging whilst the holes and 'knittiness' of it lets the light filter through. You can't see through it from the outside, either. Phew and yay. I've spent a lot of time at the Children's Home with the girls and a good number of boys too, teaching them to knit and making friendship bracelets. 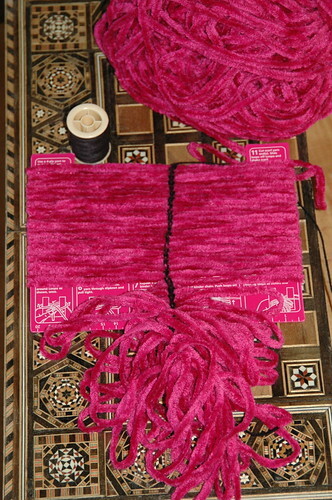 We made bags as a first project, and the girls here are busy creating stripy works of art (and listening to my ipod!). All the kids are incredibly handy - they have an almost photography memory for stitches and pick things up after I've shown them only once or twice. It's a skill which we're fast losing in the West. The girls here all have their hair shaved off before they go to school, for hygiene and health reasons (there's a fungus which is easily transmitted otherwise). Their short hair-do's show off their beautiful faces - the Rwandans are a very elegant population even in difficult circumstances. #4 has spent his days digging in the fields, clearing an area which is destined to be a building housing the education center for the children. Work on the foundations starts tomorrow. For relaxation, he decided to sit and knit with us. Trying to upload one of the finished projects - but the upload speed is horrible so I'll add more when we return to the US! I'm still limping on with my knitting projects and have resolved not to buy another scrap of yarn until I've completed every single UFO in my knitting basket. I'm so close with this sweater for #4 - it just needs blocking, sewing up and the collar added on. It was a breeze to make and would have been even easier if I hadn't decided, after knitting it once, that I should have made it a size bigger (to 'grow into') - I frogged it and started again. This sweater made me think a lot about how I choose projects and in the future I'll choose them not because they look good, but because they require big needles and chunky wool and can be done in a few hours (just like this hat). I'm just not in it for the long term any more! 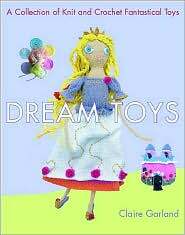 The pattern is from this book which I've checked out of the library many times, yarn is Rowan Big Wool in burnt orange. Speaking of long term, this bubble curtain is still on the pins. I've asked dear husband to forcibly remove my knitting needles and yarn from me if I ever speak the words 'I have a great idea! I'll knit a curtain!' again. It will be lovely when it's done and I'm soooo close. Within inches. I ran out of yarn, of course, and had to order another skein from the wonderful Paradise Fibers who always deliver so quickly. I'd like to finish the curtain by Christmas as a gift to myself. Ho ho ho. In a continued effort to spread the seasonal joy, I just bought these donutty stitch markers for a knitty friend from here. Very nice. It's been craft mania all around Seattle this weekend - and lots of making and doing (gifts, decorations, cards) at home here. I'll take pictures of our creations later this week. #2 and I spent Saturday morning at Urban Craft Uprising which was stuffed full of vendors selling very inspiring goodies. I met Alicia Paulson whose work and words I really enjoy and got my copy of her book signed. Sunday I took all the pack (barring #1) to the Winter Festival and Crafts Fair at Phinney Ridge which was also a lot of fun. We ate hot dogs after braving the crowds and I had the best spicy veggie dog I've ever had in the US, but can't remember the name of the vendor (Diablo? something beginning with D). Most/all veggie dogs here are revolting which is very distressing to me. In the UK we were spoiled with quorn sausages, Linda McCartney's, but most especially Tivall dogs which we still (sadly and slightly pathetically) reminisce about. I've spent the weekend knitting like a demon, trying to get my bubble curtain off the ground and to a reasonable length before I decide that it will take years to complete, it's all hopeless, and I may as well just give up. I made pretty good progress, I think - the pattern is from Mason Dixon knitting. Yarn is Louet's Euroflax sportweight linen in Mustard. A seemingly random smattering of yarn overs (all part of a cunning design I'm sure) gives this great pattern. Once it's finished, blocked and starched, the curtain is destined to hang in our front door, which currently sports a ripped piece of tracing paper tacked up with Scotch tape. Mmmm. Very Martha. #4's favorite toy, who trails along with her pretty much wherever she goes. 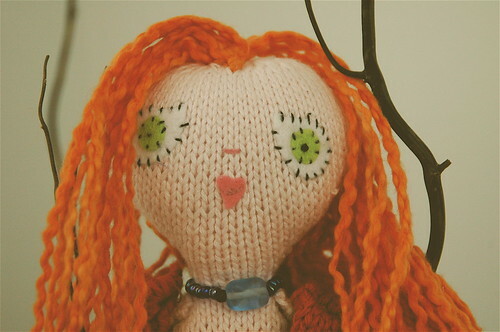 She was simple and quick to knit, the fiddliest bit being the teeny heart-shaped mouth. But it was worth it since all children, in my opinion, need a constant companion to tuck into bags, boxes and suitcases, to be chatted to and occasionally reprimanded. I had a cuddly donkey named Ned who plodded along beside me as a child, and who now lives tucked up in a box in my closet. The insides of his ears are still white and silky - although the rest of him is a bit threadbare. 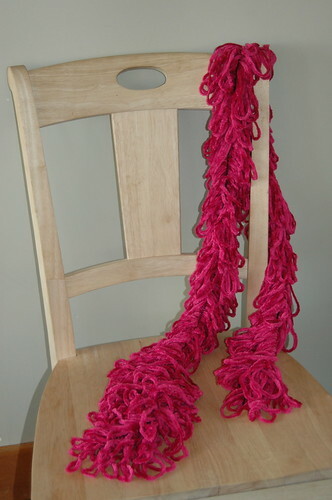 I recently made a scarf with my Sirdar Loopa which was to be sold to raise funds for breast cancer. I chose a bright raspberry pink color which of course I couldn't find in any local shops, so ordered it online from Lion Brand. The concept is simple and instructions are printed on the Loopa. 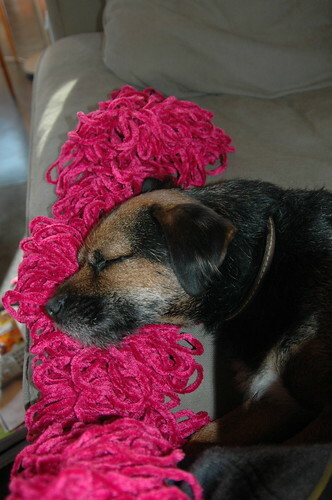 The raspberry chenille weaves back and forth on the prongs in a figure of eight pattern, and a second yarn (I chose some black wool) is used to chain stitch up the centre to secure the loops. These chain stitches are then oversewn with a backstitch. It's really a lot easier than it sounds! As always, I was ably assisted by Craft Dog. 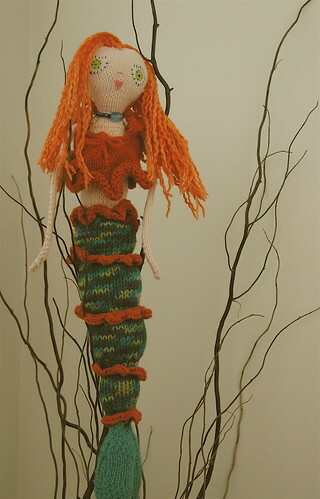 I've made another version too, using Sirdar's 'Wow' in mahogany. The quality of this chenille is much nicer than Lion Brand's which was not as chunky as it was billed to be! The loops on my Sirdar scarf have twizzled into nice corkscrews over the last few months of wear, which gives is a 'dreadlocky' look. I like it! 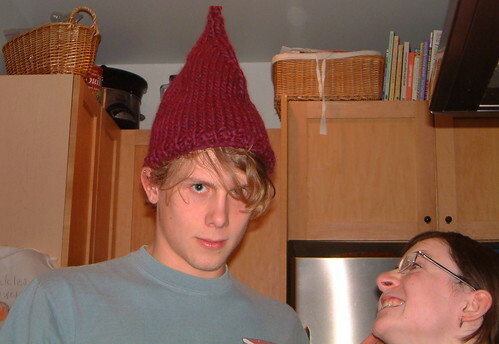 gnome hat, originally uploaded by kit and caboodle. We saw the movie of The Golden Compass recently, and aside from being disappointed by the huge oversimplification of the story (to the extent that we were all a bit confused when the lights came back on) - I loved the costumes and especially the knitted pointy elf hat and bonnet Lyra wore in a few of the chillier scenes. I did a quick google search when we got home, and I guess I wasn't the only admirer! 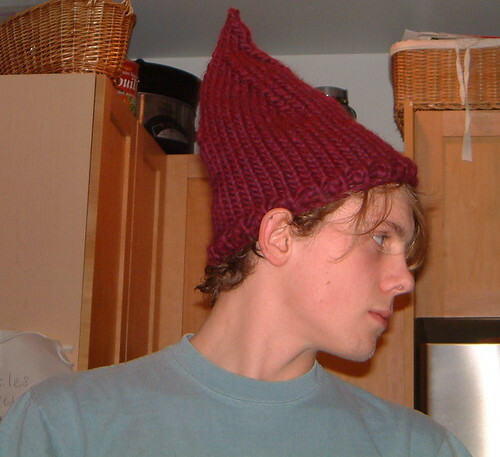 So I found a free online pattern designed by Michelle Heyman found in 'Handknit Holidays' and knitted this elf hat for my long-suffering child #1, which he is dutifully modeling. I knitted a large version first, but it proved to be ENORMOUS and would gradually slip over forehead, then eyes, then nose when walking. So I ripped it all out (hate that) and knitted the medium size. Perfect. The yarn (Cascade magnum) is super chunky and knits up incredibly quickly. It's very warm and I think looks rather sassy on him.